Heat shock protein 90 (Hsp90) is an abundant and highly conserved molecular chaperone. In Arabidopsis, the Hsp90 gene family consists of seven members. Here, we report that the AtHsp90-6 gene gives rise to two mRNA populations, termed AtHsp90-6L and AtHsp90-6S due to alternative initiation of transcription. The AtHsp90-6L and AtHsp90-6S transcription start sites are located 228 nucleotides upstream and 124 nucleotides downstream of the annotated translation start site, respectively. Both transcripts are detected under normal or heat-shock conditions. The inducibility of AtHsp90-6 mRNAs by heat shock implies a potential role of both isoforms in stress management. Stable transformation experiments with fusion constructs between the N-terminal part of each AtHsp90-6 isoform and green fluorescent protein indicated import of both fusion proteins into mitochondria. In planta investigation confirmed that fusion of the AtHsp90-5 N-terminus to green fluorescent protein (GFP) did result in specific chloroplastic localization. The mechanisms of regulation for mitochondria- and plastid-localized chaperone-encoding genes are not well understood. 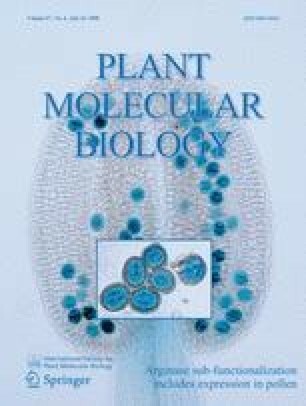 Future work is needed to address the possible roles of harsh environmental conditions and developmental processes on fine-tuning and compartmentalization of the AtHsp90-6L, AtHsp90-6S, and AtHsp90-5 proteins in Arabidopsis. We would like to thank Elli Hatzistavrou for technical assistance. This work was partly supported by a grant to PH from the GSRT, Greece (PENED 01/148) and Pythagoras I.